You know the old adage: "8-bit don't crack!" I got this as a birthday gift yesterday and I think my 17 year daughter likes it more than I do I haven't played most of these games in years. I'm very rusty. This is pretty hilarious (didn't see a SNES classic thread at a glance). Assume it is a cart dumper /Hachki all in one gadget. Saw a ton of these at the local Target the other day (no SNES-minis though). If this sells, I'd assume you see a NES one down the road, also. Well, it says it can also load ROMs from the USB, so not sure they'd release a separate device. Another option would be to use a pin adapter for the cartridge slot, since it's just dumping data. Something like the adapters for the Retrode. If you're going to to be loading your own ROMs from USB anyways, the cart feature is useless. 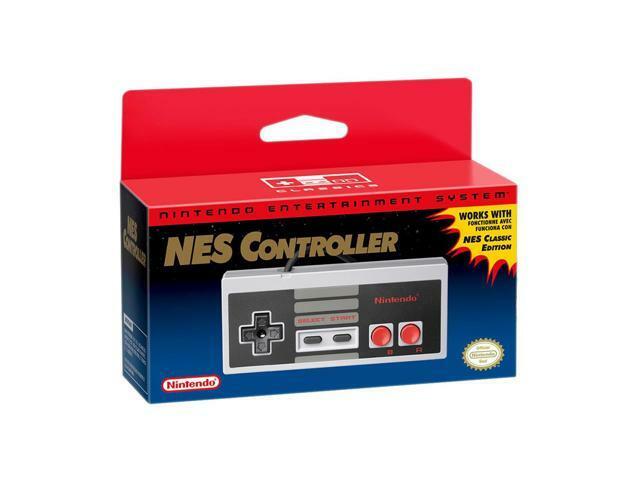 The packaging for the European NES controllers looks like it came from the 80's compared to the US version. That lower design is the style they used when they relaunched the NES in that mini top-loading design in the 90s or so. I saw a bunch of these and the SNES minis in one of my local GameStop’s the other day. I wonder why the controller is harder to find compared to the console? I went ahead and bought another NES Classic. When they first came out, I had a friend with three kids and all they wanted for Christmas that year was an NES Classic. He said he went everywhere, looked online and could never find one. So I sold him mine at face value so his children would get the one thing they wanted most. I have been meaning to pick up another one but have never gotten around to it. I saw that one this morning and got the last one they had. The Gamestop I bought this one from had plenty of extra controllers for sale. I guess it varies from store to store. There likely was a higher-than-normal demand for the controllers at re-release, since there were a lot of existing owners from the first release that wanted controllers. Now that they've got the controllers they were waiting for, the demand has probably leveled out. The NES Classic and SNES Classic are on their surprise farewell tour, according to Nintendo of America president Reggie Fils-Aime. In an interview with The Hollywood Reporter earlier this week, Fils-Aime said that both mini-consoles will not return to store shelves once their current stock sells out — essentially making this holiday season their last. Seems to be plenty of stock all around by now though, saw plenty of both (and the PS Classic) at Best Buy a couple days ago. It's not clear from the Polygon repost, but I don't think this necessarily means Nintendo has stopped shipping them yet. They could continue shipping through December to make sure they don't sell out before Christmas, then stop shipping in January. I have been looking for the Super NES and it has been out of stock in my area. I have seen stock for the NES and PS1 Classic. I saw the NES Classic at one of my local Wal Marts yesterday. Glad to see it, as I'm getting one for Christmas. Nintendo has long said - and more than once - that these systems were limited and to be available "through the holiday season". Not a surprise. I don't see the issue in reminding readers, especially quoting a more recent interview with Reggie. Heck, I didn't know or remember. Sounds like you just don't like Polygon, but plenty of other publications and sites have also posted similar articles today, so I guess you can pick any of them to complain about. Last edited by fumanstan; 12-14-18 at 05:58 PM. They called it a "surprise," which it's not, and claimed that "both mini-consoles will not return to store shelves once their current stock sells out," which isn't necessarily true, as Nintendo has committed to supplying them through the end of the year. As for other news sites, they may or may not have reported the story in a worse way, but they weren't quoted here. Seems nitpicky. I wouldn't call either of those major reporting errors, but I won't argue since you always take things so literally. Last edited by fumanstan; 12-14-18 at 07:56 PM.